According to the U.S. Department of Labor, over 90% of IT workers are performing jobs outside the IT industry. While many believe this reflects a skilled labor shortage in the IT industry; StayStaffed believes that information technology staffing can be resolved with our workforce management system and its enhanced job-to-candidate skill-matching process. With a full range of recruitment services including Candidate Direct Marketplace® Vendor Management Systems (VMS), Managed Service Provider (MSP), and Recruitment Process Outsourcing (RPO), employers have the ability to optimize their IT staffing in partnership with a dedicated StayStaffed Client Account Manager. Our contingent workforce management system combined with our reputable staffing agencies nationwide, will help you to source, recruit, hire or optimize your contingent IT industry jobs quickly and efficiently. 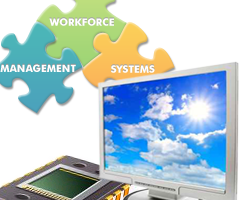 StayStaffed provides IT staffing services via our cloud-based Vendor Management Services (VMS). An enhanced candidate-matching process that allows you to identify highly-suitable candidates from our marketplace of IT staffing agencies located all across the nation. The ability to source, recruit, and fill high-quality IT industry jobs quickly by optimizing the hiring process. Results include improved hiring metrics, reduced overtime hours, and an efficient resource to staff your IT projects. VMS analytics and management reporting that improves management oversight, vendor performance, IT staffing and project management efficiencies. An ability to respond to shifting priorities by optimizing IT staffing through a centralized VMS solution. Due to our cloud-based workforce management system, no hardware, software, hosting or service fees are needed to realize the benefits of our VMS IT staffing solution. A dedicated StayStaffed Client Account Manager and 24-hour customer support. Learn how you can optimize your Information Technology staffing by contacting us now for a 15-minute online VMS demonstration or get more information on the StayStaffed Managed Service Provider (MSP) and Recruitment Process Outsourcing (RPO) programs. Our workforce management system for the IT industry help companies optimize their information technology staffing through the efficient use and management of their contingent workforce. With our state-of-the-art candidate-matching process and a nationwide database of highly-skilled IT industry workers, recruitment and hiring costs are reduced while, at the same time, allow you a greater ability to adjust to fluctuating market conditions or IT project scheduling. IT industry software fills staffing requirements jobs reliably by providing high-quality IT candidates with the right skills to perform the right job at the right time. The overall contingent workforce lifecycle can be managed and provides critical insight into how your information technology staffing services perform. Contact a StayStaffed representative today for a free, no-obligation demonstration and see how workforce optimization can improve your company's performance.